The Mary Mountain pack formed when a dispersing male (636M) from the Cougar Creek pack joined up with a group of females from the Gibbon Meadows Pack during the 2010 breeding season. The Gibbon Meadows pack had moved outside the western border of the park, allowing room for the new Mary Mountain pack to establish itself in the old Gibbon Meadows pack territory. By the first fall the pack contained 6 adults and 2 pups. 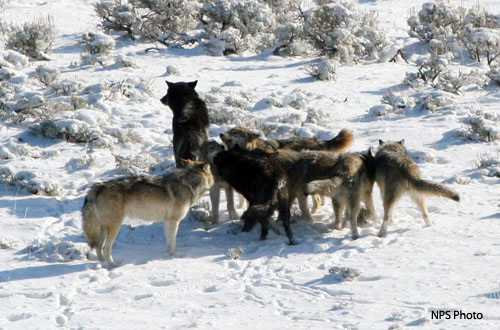 The alpha male (636M) was killed by wolves from the Mollie’s pack in December 2011. Shortly thereafter, a young adult male (758M) from the Mollie’s pack replaced the alpha male, becoming the mate of the existing alpha female, 794F. Similar to the Gibbon Meadows pack, the Mary Mountain pack’s territory shifted outside of the park boundaries in December 2012. This pack is no longer considered a park pack.